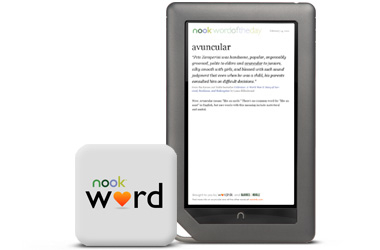 Wordnik, the largest English language dictionary and provider of word related services, just launched NOOK Word of the Day with Barnes & Noble for the NOOK Color. The application helps NOOK readers to expand their vocabulary while also discovering great new books NOOK Book Store. Powered by Wordnik, the world's largest online dictionary, the NOOK Word of the Day app shows interesting words in context, as they are really used by the best (and best-selling) authors. It also includes audio pronunciations! It is available on the NOOK Color from the NOOK App store.